Iddo Katz is an archeologist and tour guide licensed by Israel’s Ministry of Tourism. Iddo is a 7th-generation born Israeli who graduated from Bar-Ilan University with degrees in Land of Israel Studies, geography and biology. 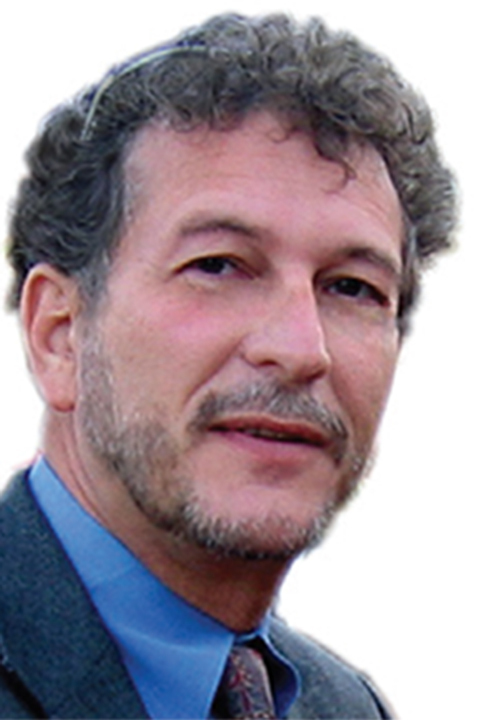 A former lecturer at the Schools of Tour Guides at Bar Ilan University, Iddo has also lectured widely throughout the United States and Israel and was the area manager on archaeological excavation sites, including a well-known site at Shiloh. Morocco — exotic, mysterious, sensuous, and dramatic—a land of extremes, from high mountain peaks to deserts, lush valleys, and Kasbahs. Morocco, homeland to a unique Jewish culture that was formed during the age of Islamic ascendancy and later flourished with the spread of European culture in the Middle East. Led by Iddo Katz, archaeologist and outstanding guide from Israel and expert on Moroccan Jewry and a superb local guide, we will immerse ourselves in the heritage and tradition of the Jews of Morocco, we will immerse ourselves in the heritage and tradition of the Jews of Morocco, experience the traditional arts, crafts, and music, and learn about the particular fascination that Moroccan Jews have had with charismatic rabbis, saints, and healers. 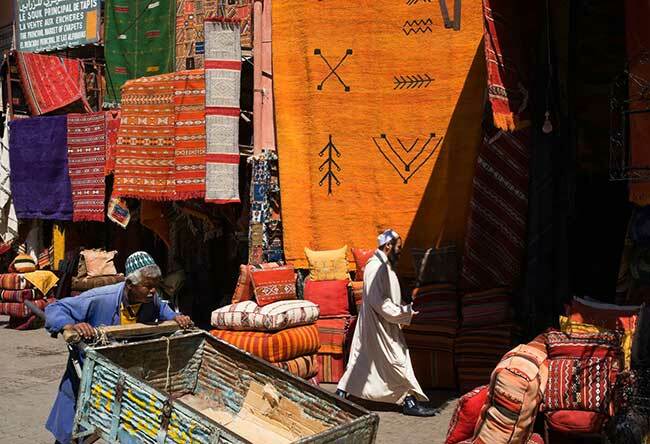 Along the way, we will explore picturesque souks, breathtaking coastline, and medieval streets, and visit a local Berber marketplace in the High Atlas Mountains. We invite you to join us on this extraordinary journey! 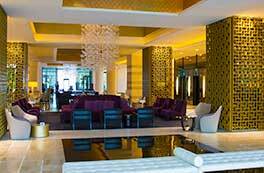 Check in to the five star, centrally located Movenpick Casablanca which combines French elegance with exotic Moroccan touches and features breathtaking views of Casablanca. Evening: Introduction to our trip and overview by our accompanying scholar Iddo Katz, followed by a welcome dinner at our hotel (included). Enjoy the first of our daily, lavish, buffet style breakfasts before departing for a day of touring in Casablanca, including a visit to the main synagogue and the Casablanca Jewish Museum. 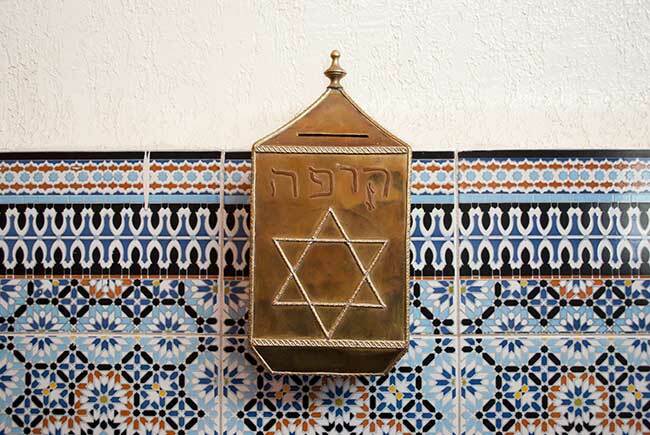 The only Jewish museum in the Islamic world, the museum traces the history of Morocco’s once thriving Jewish community. 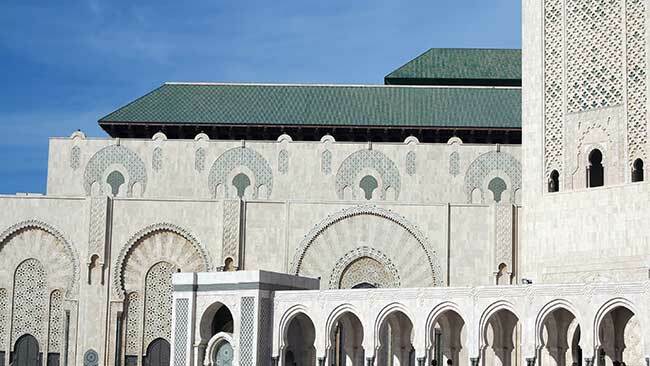 Other sites we will visit today include the Mosque of Mohammed II – the largest mosque in the world after Mecca, dramatically situated at the edge of the Atlantic – and the Marabout of Sidi Abderrahman, a holy shrine built on a rocky outcropping in the Atlantic Ocean to which women travel from all over Morocco in search of miracles. Lunch is included at a lovely restaurant along the sea. Evening: Discussion led by Iddo Katz. Dinner on our own. Depart Casablanca for Fez. En route, we will visit the partially excavated, extensive Roman ruins of Volubulis (a UNESCO World Heritage Site) and view many old town-houses featuring mosaic floors derived from the prosperity of the olive market of the past. From Volubulis, we will continue to Meknes – once home to several thousand Jews and whose monumental city gates are among the finest in the Arab world. Other sites we will visit today are the tomb of the feared Moulay Ismal, who modeled his capital Meknes in the image of Versailles, and the Nekkag (Jewish Quarter) with its narrow lanes and colorful courtyards. Lunch in Meknes (included) before we continue on to Fez and check in to the five-star Marriott Hotel Jnan Palace hotel in time for dinner (included). Today we will step back centuries into the medieval world of Fes-el Bali (Old Fez) whose maze-like streets, ancient mosques, minarets and Souk symbolize the mystique of this ninth century city. Highlights of our day in Fez will include the Medressa (Koranic University) Bou Inania, a religious building that is still in use and open to the public and the Batha Museum, which houses a fascinating collection of Moroccan arts and crafts. In the afternoon, we will explore the Medina and its organized handicrafts and souks as well as see the house of Maimonides with its mysterious water clock. Today, we will be taking an in-depth look at the history and culture of traditional Morocco. We will explore the mellah (Jewish district) of Fez, founded in 1438 and once home to tens of thousands of Jews. At its height, the Jewish community included 40 synagogues, a Bet Din, communal ovens, ritual baths and many schools. Other places we will visit today include the vast Jewish cemetery opposite the gates of the Royal Palace, the restored Ibn Danan Synagogue (oldest extant synagogue in Fez) and the recently restored Al Fassiyeen synagogue nearby. This evening we will enjoy a Shabbat dinner at our hotel (included). Optional: Attend services at Fez synagogue. Or…Free day to rest and/or explore Fez on our own. Evening free; dinner on your own. This morning we depart Fez and drive to Rabat, enjoying lunch along the way (included) at Marina Sla – a lovely restaurant facing the river in Sake, an old walled city on the Atlantic Coast. Upon arrival in Rabat, we will check in to the five-star Sofitel Rabat Jardin des Roses with time for a quick rest before we begin a tour of Rabat at the ancient necropolis of Chellah. A thriving city for nearly 1,000 years, Chellah’s ruins date back to Roman times. The Chellah is also known as a favorite destination for bird-watchers. 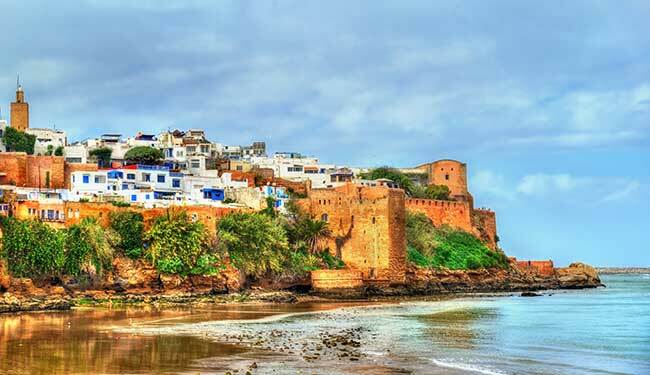 Other sites we will visit today include the picturesque labyrinthine Kasbah des Oudaias which overlooks the Atlantic Ocean, and the lovely Oudaya Gardens outside the Kasbah. We will end our day at the majestic Hassan Tower and the Mausoleum of Mohamed V before returning to our hotel. Evening: Dinner at the hotel (included). 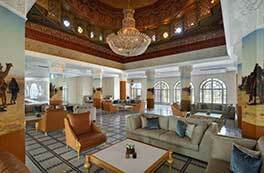 Depart Rabat for Marrakech where we will check in to the five-star Movenpick Mansour Eddahbi Marrakech hotel. Lunch en route (included.) In the afternoon, we will begin our exploration of the tantalizing city of Marrakech by visiting the defining landmark of Marrakech – the 12th-century tiled minaret of the Koutoubia mosque. In the early evening, we will visit the frenetic Djemaa el Fnaa – the most splendid square in all of Africa. This exotic square was once the ultimate destination for traders from diverse places such as Venice, sub-Saharan Africa and Asia. Today, it provides ever-changing entertainment for Moroccans and foreigners alike, reaching its climax at sunset when the square is alive with storytellers, healers, snake charmers, acrobats, and countless food stalls. Evening: Dinner at our hotel (included). 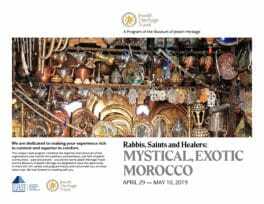 Today’s highlights will include the Musee de Marrakech (housed in a 19th-century Mnebhi Palace) and the Dar Bellarj Cultural Foundation – established to showcase Moroccan culture. Over the course the day, we will stop for tea or orange juice at the beautifully restored Dar Cherifa (which houses a cultural foundation, bookstore and art gallery) and experience the colorful souks of Marrakech. At the souk, each trade (spices, carpets, jewelry, enamel, copper, brass, cedar) is situated in its own unique quarter. Here, we might view villagers bringing in their handmade rugs to sell to merchants or observe artisans hand-tooling crafts as they have done for centuries. Lunch (included) in the Medina. Evening: Dinner on our own. We will begin our day with a visit to the mellah (old Jewish quarter) of Marrakech, dotted with narrow streets, ancient synagogues and an extensive Jewish cemetery. Later, we will enjoy an excursion to the plush, green Ourika Valley, where some people still travel to the market on donkey. In the valley, we will visit an authentic Berber village, explore the culture of the “Tzadikim” in Moroccan Jewish history, and visit the tomb of Tzadddik Rabbi Shlomo ben Hans, whose burial place is the focal point of a yearly pilgrimage by Moroccan Jews. Other sites today include the village of Tafza and the Berber Eco-museum, which contains collections of Berber artifacts, an exhibition of antique photos of the High Atlas, documentaries. During the course of our travel, enjoy magnificent views of the Ourika Valley and Seth Fatma – known for its seven waterfalls and Berber rugs. Lunch (included) in the Ourika Valley. We will spend this morning at the tropical Majorelle Gardens – lovingly restored under the patronage of the late Yves St. Laurent – and the small but excellent museum of Berber culture, located in the home of painter Jacques Majorell. Later in the day we will visit the opulent Saadien Tombs – the mausoleum of the great dynasty that once ruled North Africa. Lunch on our own and afternoon free before closing meeting and dinner at our hotel (included). 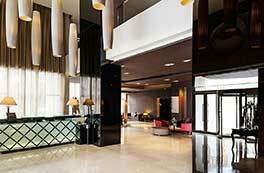 The Mövenpick Hotel Casablanca is centrally located and only a short distance from the Old Medina. Guests here will find they are able to immerse themselves in the style and colors of Moroccan life while enjoying a welcoming and comfortable 5-star accommodation complete with a rooftop pool and stunning views. 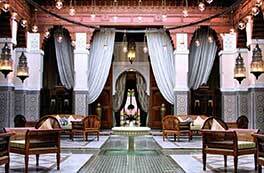 This historic 5-star luxury Jnan Palace hotel in Fes is situated near the Medina de Fez and the Batha Museum. It is considered among the finest accommodations in the city, and each room features a balcony that overlooks the pool, gardens or the city, as well as stylish décor. The completely renovated, 5-star Sofitel Rabat Jardin des Roses is surrounded by a 17-acre garden which contains over 3000 roses. Graced with views of the imperial city and Andalusian gardens, this majestic hotel occupies a unique position in the heart of the capital city Rabat, and is situated close to the Royal Palace and Mausoleum of Mohammed V.
The Mansour Eddahbi Marrakech is a five star hotel that offers a warm welcome to visitors of the captivating “Red City” of Marrakech. Located in the central L’Hivernage district just a few minutes from the Medina, the Majorelle Garden and the Menara, the hotel is a contemporary oasis away from the exciting hustle and bustle of the city. Travel in comfort. We stay at deluxe hotels with fine amenities. Accommodations for this trip listed below. *Per person, double occupancy for registration by December 20, 2018. Cost after December 20 is $6,100. Single supplement ($975) and gratuities ($165) additional. A $1,000 per-person nonrefundable deposit due upon registration; second deposit of $1,000 per person due December 1, 2018. Balance in full due 90 days prior to departure.